Communication in agile software development… Does it matter? Having a fluid dialogue within the agile software development company and with the client is key for the success of any technological solution. Why? Is communication important within this methodology? Read on to find out. In 2001, a group of software developers gathered to publish the Manifesto for Agile Software Development. In it, they made clear that communication is key to succeed in a software development project. Words like interaction, collaboration and negotiation stand out in this Manifesto, marking a clear change in the way we work both within development teams and in the way the team interacts with the client. The arrival of agile methodologies was brought by the need to adapt rapidly, not only to the progress of technologies in software development, but also to the speed in which business and industries evolve. Indeed, agile methodologies encourage a transition from a traditional and formal communication, to a casual and direct one (face-to-face) that allows clients and development companies to work more closely together and share openly and fluidly all project information. (Read as well: How do you select your technological partner: Key points to make the right decision). Agile communication: Why is it so important in software development? Alistair Cockburn, one of the co-authors of the Agile Manifesto and forefather of the agile movement, rightly points out when he describes that software development endeavours are “a cooperative game of invention and communication”. It is precisely in this game of cooperation, where communication plays a critical part in the success of a technological solution: the more frequent the communication, the more productive will be the project’s convergence, which ultimately results in better performance of the development team and therefore, a better final product. 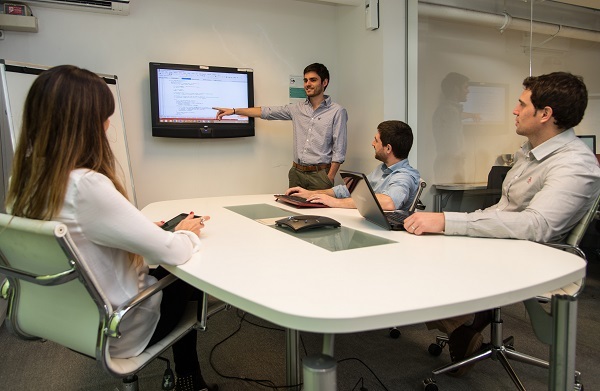 Juan Emilio Inzaurraga, project manager at Hexacta, emphasizes how actively communication-oriented agile methodologies are, since, for example, “it offers tools like a daily meeting (daily call) where the client is involved, which guarantees that he is aware of the team’s progress and impediments. At the time, this simplifies decision-making and quick troubleshooting that may arise along the way”. Unlike traditional methodologies where the client places an order and the development team executes it –Inzaurraga continued– “in agile methodologies, client and development team work more closely together, making the feedback cycle faster and ensuring the development meets the client’s expectations. The daily, planning, review and retrospective meetings allow us to be synchronized with the client to achieve the goals”. Mark Layton, a well-known author and expert on agile methodologies, explains in his publication ‘Agile Project Management for Dummies’ that: “To manage communication on agile projects, you need to understand how different agile communication methods work and how to use them together”. In this sense, Layton points out that the face-to-face talks are the heart and soul of agile software development projects and that agile meetings “have a specific purpose and a specific amount of time in order to allow the development team time to work, rather than spending time in meetings”; however, he also indicates that apart from these communication channels which are more direct, there are also a number of “devices” (product roadmap, product backlog, sprint backlog, among others) that complement the entire communication process and ensure a constant tracking progress during development. Cockburn refers to the existence of several ways of communication that people can use when they work in teams (based on Media Richness Theory), both at the stage of documentation and the development one (See Figure 1). 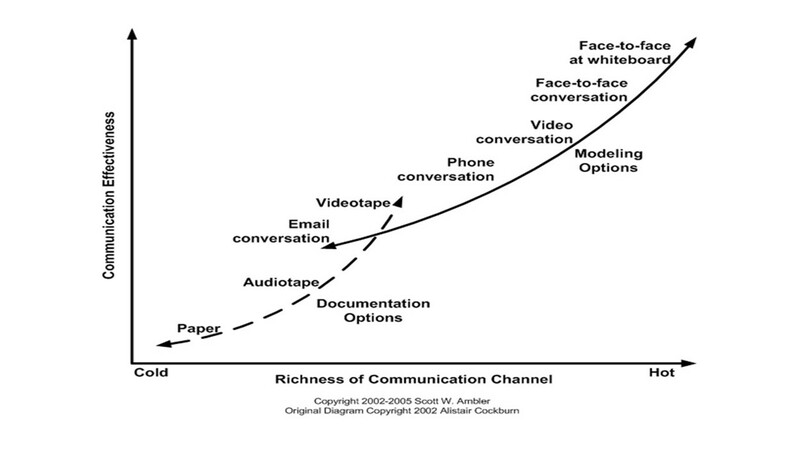 It is understood from this graph that with better interaction, the communication will be more effective. According to Inzaurraga, it is necessary (when working with agile software development companies) to decentralize the communication process and generate as many channels as possible to ensure a more open, direct and multidirectional interaction. “One of the main communication problems with the outsourcing teams has to do with centralizing communication in a person who, usually, is the project leader (Scrum Master). This, instead of being efficient, can become a bottleneck because there is not a smooth and fast communication between the development team and the client and that may cause delays in the process”, he says. It is essential to define and generate with the client the tools and communication channels as early as possible to guarantee that the team performs optimally, while strengthening the relationship with the client. “Once the project begins you must define the channels and frequency for internal and external communication (with the client’s company) so that everyone is clear on how to act. From that point forward, communication must be as horizontal as possible to avoid rework, unnecessary adjustments and changes. It is important to include all team members in this process and keep in mind that using a single method of communication is not enough”, Inzaurraga concludes. Listen: This is simple and almost obvious advice. Listen to team members because they can provide valuable insights which those can improve productivity. Create an “open doors” policy: Allow all those involved in the project’s development within the company to participate. Allow the space for questions, concerns and solutions that will help to reduce the chances of making mistakes. Set specific goals: It is important to use daily or weekly meetings as a space to keep the team informed about the goals, analyze impediments and ensuring that the project stays on target. Choose the best communication channel: Each communication channel has its purpose. Not everything deserves to be communicated via Skype or face-to-face, but also not everything should be treated via email. Know how to choose the best way depending on the context and needs. 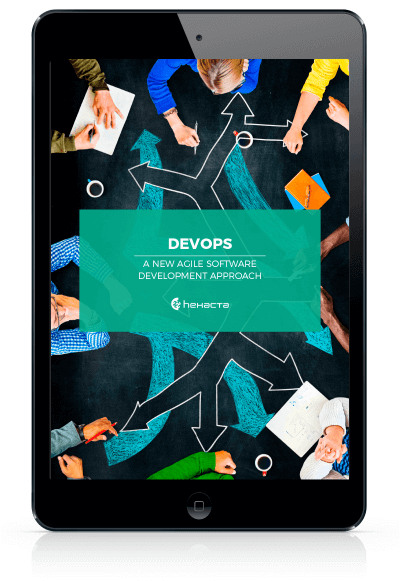 To achieve the success of any technological development it is essential to ensure an open and fluid communication with your agile software development partner, because the fulfillment of your project’s goals depends on it. 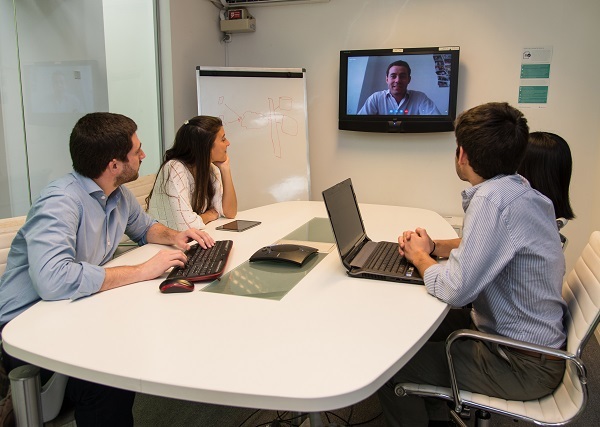 In the agile world, communication is an essential element to ensure that the development process is as clear as possible; this stresses the importance of dealing with a technology partner –offshore or nearshore– that has the experience and the ability to offer different communication channels that allow you to be aware of every step of development (Do not miss Is Argentina an attractive hub for American companies?). Good communication, using different methods (verbal and nonverbal) will help minimize risks, maximize teams’ productivity and ensure that the final product is in line with your expectations. Has communication influenced in your relationship with your technology provider and with expected results?